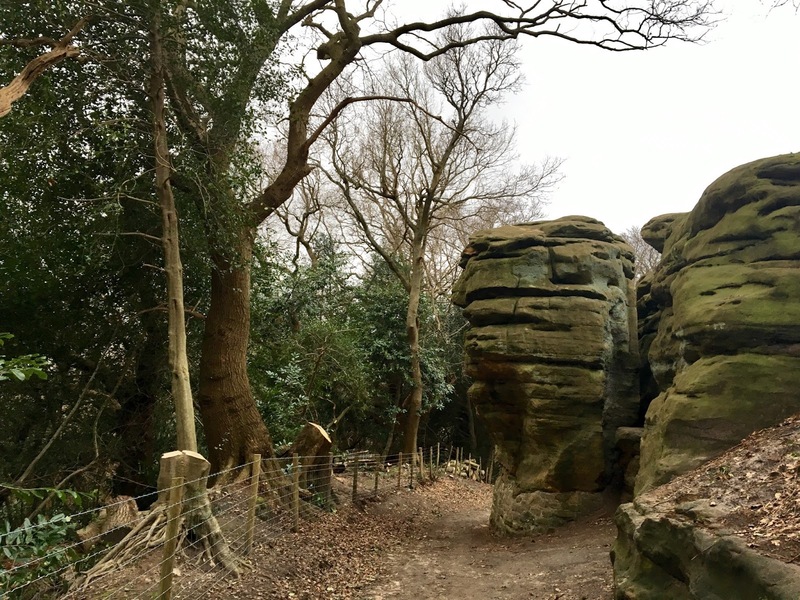 There has been a clean up of the overgrown areas and the outcrops at Happy Valley and the leaning tree above Cheesewing Buttress has also been cut down. 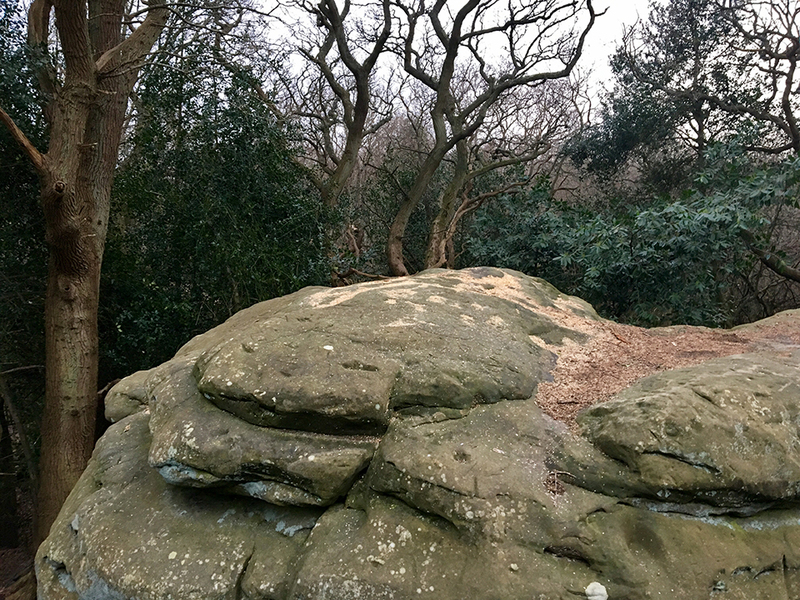 Probably unknown to the Tunbridge Wells Commons Conservators, the leaning tree was used to attach the belay for top-roping, but now it's no longer there, so top ropes cannot be set up. Some of the HRMG are looking into whether bolts can be placed in the top of the block so climbing can take place on this buttress. "The work at Happy Valley is now almost complete, just a bit of tickling round the edges still to do. I must say that the contractors have done a wonderful job and the area has been transformed. 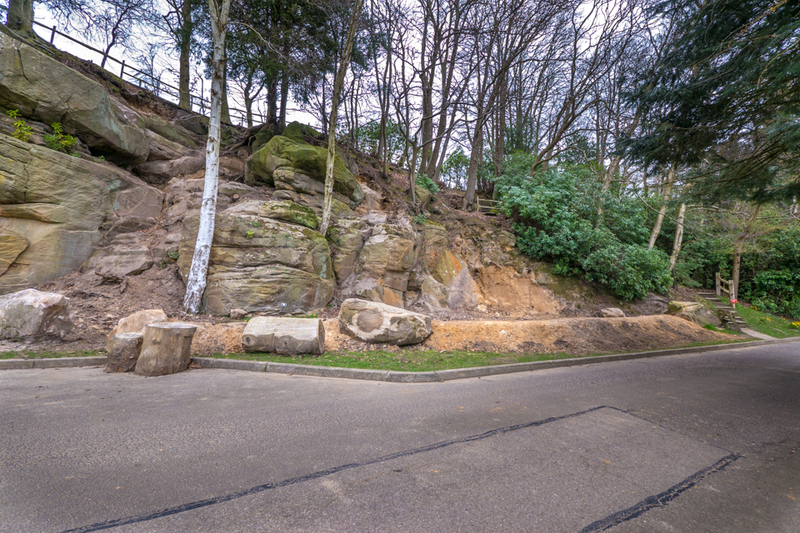 Far more of the rock outcrop has been re-exposed than I had expected and the removal of the fallen trees from the Cheesewring Rock has let much more light into the area. It obviously looks a little raw at the moment but it will soon start to soften." The Bowles team have been hard at work clearing away soil and excavating the area at the very far right of the crag. Routes do exist here but with the recent work, these have been enhanced. Bolts are planed to be installed and work is almost finished. Six or seven new climbs have been added by the keen Bowles team and will also be included in the new Rockfax guide coming this summer. Until work is completed, please avoid this area. 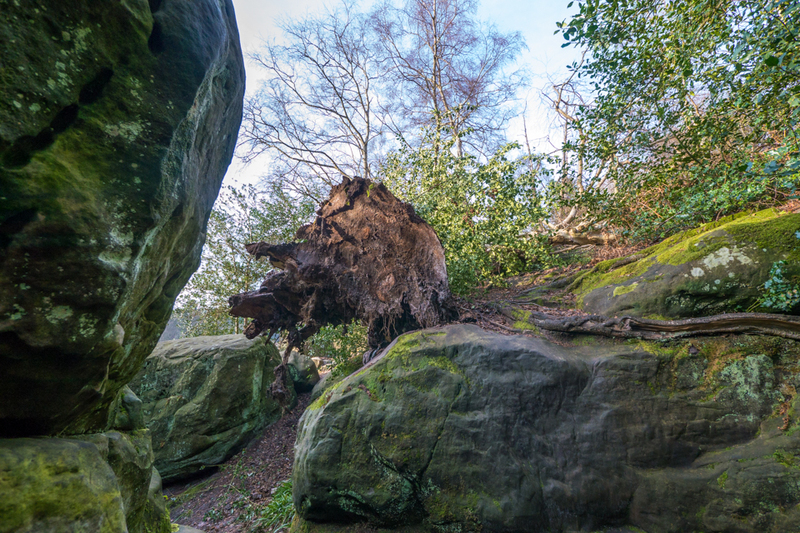 The fallen tree above St.Gotthards Boulders. Storm Doris back in February ripped up a few things and in particular the large tree at the top of St.Gotthards Tunnel at Harrison's Rocks. Eridge has also seen trees come down above the rocks in a few places. A massive tree has fallen above Stem Son Buttress (although this may have happened prior) which really could do with being removed. In addition the Sussex Wildlife Trust has removed a large chunk of the tree that was opposite Sandstorm Buttress which is worth a look.